As Christine Blasey Ford recounts her allegations of sexual assault by Supreme Court Nominee Brett Kavanaugh, the echoes of Anita Hill's testimony are hard to miss. Separated by three decades, both women have brought forward high-stakes allegations of sexual misconduct against Supreme Court nominees before the Senate Judiciary Committee as the nation watches. Both of the men in question categorically denied any allegation of sexual misconduct. Although Professor Hill's testimonies ended with the confirmation of sitting Supreme Court Justice Clarence Thomas, women across the nation rallied behind then University of Oklahoma professor before and after the confirmation, reinvigorating the women's movement socially and politically. "Millions of women found themselves sitting down the men we know and love and saying, 'This really happens. Let me tell you about it.'" Here's how the Anita Hill hearings rocked a nation in 1991. According to MAKER Gloria Steinem, sexual harassment claims filed to the Equal Opportunity Employment Commission increased by 500 percent. The activism sparked by the way Hill's allegations were treated by the all-white male Senate Judiciary Committee rang in what has now become the "Year of the Woman," a period in which a record number of women ran for political office in 1992— and won. With an influx of money and support from women across the nation, political action committee E.M.I.L.Y. 's List helped elect 24 Democratic women to Congress. 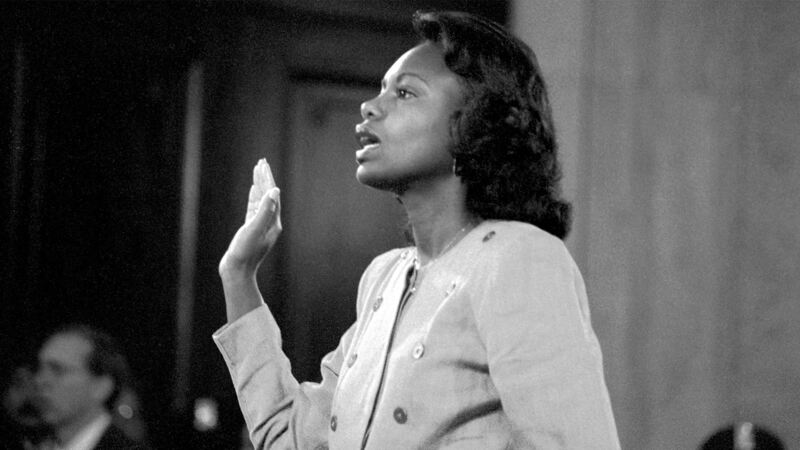 "There's no question that Anita Hill inspired others to come forward. But Anita Hill did something even larger for women," says Eleanor Holmes Norton, the EEOC chair at the time of Hill's hearings. "Every new group has a moment which is legitimately called a revolution. Once that first burst, in fact, breaks through, that revolutionary moment may be gone, but the notions, the movement, the energy continues." In the wake of the mounting allegations against Supreme Court nominee Brett Kavanaugh (as of Sept. 26, three women have publicly accused Kavanaugh), the rumblings of women rallying behind Ford and against a culture of sexual abuse that is all too familiar have begun once again. Across the nation, women and men in black stood in solidarity of Ford and other women who have since come forward on Sept. 24, raising their voice and demanding that this country finally "believe survivors." "There is no way to redo 1991, but there are ways to do better," says Anita Hill herself of the current Brett Kavanaugh hearings in an op-ed for The New York Times. "With years of hindsight, mounds of evidence of the prevalence and harm that sexual violence causes individuals and our institutions, as well as a Senate with more women than ever, 'not getting it' isn't an option for our elected representatives. In 2018, our senators must get it right." Learn more about how the Anita Hill Hearings rocked a nation in the words of the women who lived it—and made history, in our documentary "Women Who Make America."